We, the undersigned NGOs, are gravely concerned with the comments made by the Minister of Domestic Trade, Cooperatives and Consumerism Ismail Sabri Yaakob regarding human rights organisation SUARAM. The Minister is reported to have said that the financial accounts of Suara Inisiatif Sdn. Bhd, which is linked to SUARAM and currently undergoing investigation, are “highly suspicious”. While we fully acknowledge that any allegations of irregularities in the financial accounts of an organisation can and must be investigated, we wish to remind the authorities to be impartial and fair in carrying out the investigation, as their first duty is to the Malaysian public, not to the government of the day. Moreover, as expressed in the recent press statements issued by SUARAM, the NGO has given its full cooperation to the various authorities involved. In fact, it is the authorities themselves such as PERKESO who do not seem to be on top of the investigation process, thus raising further suspicions of political motivation. We also wish to question why the Companies Commission Malaysia (CCM) has only launched its investigation now, after the president of Jaringan Melayu Malaysia (JMM) questioned SUARAM’s legitimacy as an NGO. Once again, this raises doubts due to the timing as the on-going Scorpene submarine investigations by SUARAM have revealed tremendous discrepancies in the financial accounts of the government-linked companies involved. 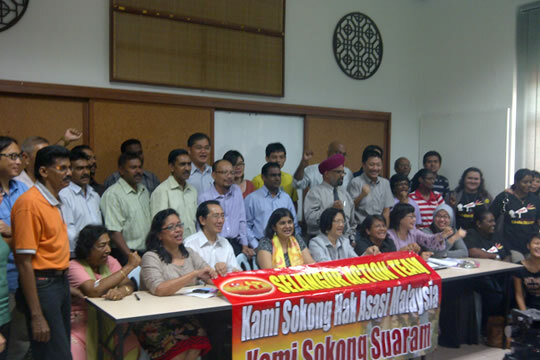 We demand an immediate end to the harassment against human rights defender, SUARAM. We also strongly support SUARAM’s challenge to the government and its agencies to speedily inspect and investigate Perimekar Sdn. Bhd. and Terasasi Sdn. Bhd. and reveal its findings to the public in the same manner which they have handled the investigations against SUARAM. We continue to stand in support of all those who work in defense of human rights and democracy in Malaysia and reiterate our full support for SUARAM.